Help children understand and use figurative language with these sorting cards for your classroom. We have created these cards to provide some examples of different types of figurative language. Each set contains a title card along with 14 examples. Use them individually to enhance specific mini-lessons or have students sort the cards to see if they understand all of the concepts after teaching. To get students up and moving, after teaching all or some of the concepts, place the title cards around the room and give each student a card. Their job will be to go stand near the sign that describes the example on their card. Check them together once all students have a spot by having students read them aloud. To extend the learning, have students keep track of figurative language they find in their own reading. 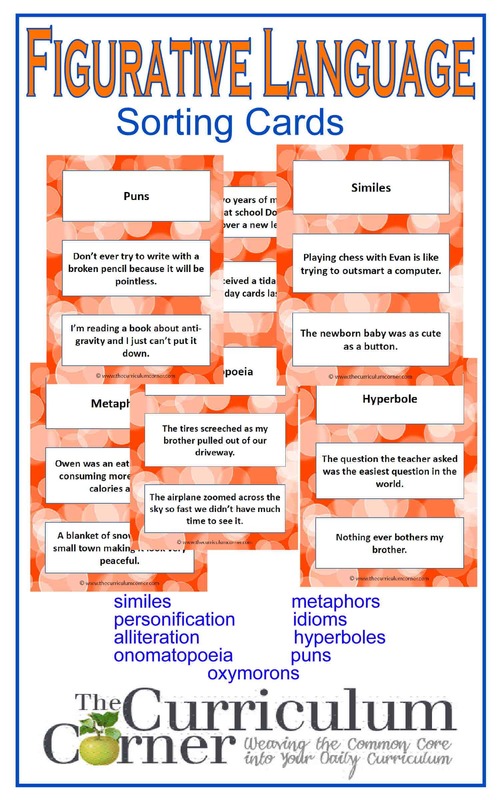 Even better, encourage writers to add figurative language to their current writing project. Have other ideas for using these cards? Please share below so that other teachers can benefit from your creativity as well! Choose the sets that work best for your instruction and learning goals. We have also provided a blank page of cards with each set in case you would like to write your own examples or have students write them. As an extension at a literacy center, encourage students to add their own to each collection. This is going to be so amazing to use when reviewing these. Thank you! These are awesome! Thanks so much!!! My pupils loved this. Tq so much.